Terahertz Device Corporation offers a cutting-edge product line of quantum interband cascaded super- lattice light emitting diodes (QuiC SLED™ ). Using GaSb/InAs-based heterostructures, our patented fabrication processes allow Terahertz to produce LEDs that span the entire mid-wave and long-wave infrared spectrum between 3–12 μm. In IR spectroscopy this region is called the “fingerprint region”. Terahertz LEDs are capable of generating more than 2 mW of peak output power when driven at sufficiently high current. QuiC SLED™ structures have a few thousand nanometer-scale superlattice layers that provide electron and hole injection and confinement to the light-emitting junctions. Electrical current is spread with a metal mesh-semiconductor composite cathode to mitigate the severe current crowding otherwise found for these long-wavelength devices. Within the mesh opening, etched dielectric buttes help extract the light from these high-index materials with n = 3.8-4.0. Small changes in the emitting superlattices are used to adjust the emitting wavelengths for a given sensing target, with the rest of the device fabrication staying the same. 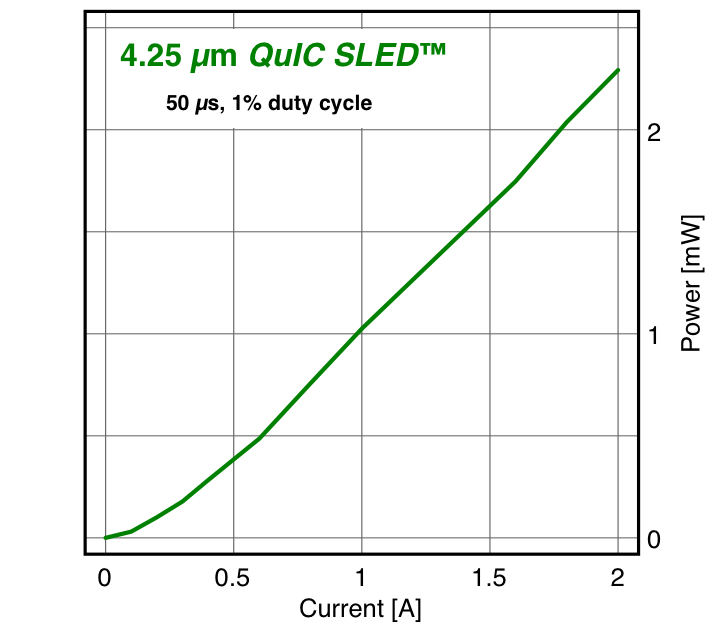 The heterostructures produced by the QuiC SLED™ process allow for more current to be translated into photons, increasing power output and reducing losses that are dissipated as heat.